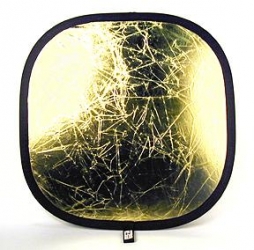 Great portability is one of the advantages of Westcott's collapsible Illuminator Reflectors, as they collapse to approximately 1/3 their opened size and slip into a zippered circular bag. The panels provide the ability for different light control when needed. This panel has a silver coating one one side and gold on the other, so it can provide both neutral and warm reflected light.